Tellychakkar.com had exclusively reported about the exit of seasoned actor Manoj Joshi from the Colors popular show, Chakravartin Ashoka Samrat (Contiloe). Well, we now give you more details on the heart-breaking death of Chanakya in the show. As per the ongoing track, Khallatak (Manoj Kolatkar) has sent a letter to Chanakya to meet him alone in the forest region. The idea and plan of Khallatak and his team is to trap Chanakya alone and kill him. The scenes will be emotional as all the four of them will pull their swords out and stab Chanakya. The final blow will of course, be given by Siamak (Faizan Khan) who will stab Chanakya right on his heart. Meanwhile, Ashoka (Siddharth Nigam) who would get a sniff of something going wrong with Chanakya will come to the forest area. But before he would set his eye on Chanakya, Khallatak will set the hut in which Chanakya is put on fire. However, Ashoka will come to the place and rescue Chanakya from the hut. But the sad part will be that Chanakya’s body will already be burnt. As his last words to Ashoka, Chanakya will tell him that his journey has ended while Ashoka’s journey will begin now. With Chanakya’s death, there will be sorrow all over. For more than a year, the historical drama, Chakravartin Ashoka Samrat (Contiloe) on Colors, has been entertaining us. And it’s time to raise a toast for the makers and the artists of the series. On the special occasion when we chatted with Suzzane Bernert aka Helena, the lady excitedly shared, “I am grateful to my fans for accepting me in a negative role. Not only my co-stars but the entire team has been super supportive to me. And to speak about the memories associated with Ashoka, I have so many to share that I can go on for the entire day”. Ever since Chakravartin Ashoka Samrat launched on Colors, the show has witnessed the bitter rivalry between young Ashoka (Siddharth Nigam) and Sushim (Sumedh Mudgalkar). Be it a tussle for power or a clash of egos, Ashoka and Sushim have matched wit and muscle on multiple occasions. And now, the duo will be seen in a duel of sorts to determine who is truly the strongest of them as they battle it out to win Emperor Chandragupta Maurya’s sword. Joining them in the final leg of the competition will be Noor Khorasan’s younger son Siamak. As the story unfolds, what started out as sword fights to determine the physical strength of the candidates under the guidance of Acharya Shreesth. After two rounds of eliminations, it comes down to Siamak, Sushim and Ashoka as they enter the final leg of the competition with their final win guaranteeing them the coveted sword. The competition kicks off with all 3 entering a maze at the centre of which is Chandragupta Maurya’s sword. And their journey is anything but simple. Rife with obstacles, the maze turns into a battle of patience and grit. However, only two people are strong enough to make it to the final obstacle – Ashoka and Sushim. In the last phase of the competition, Ashoka and Sushim come face-to-face with a tiger and it is only after passing this stage that they will be able to claim the sword. After weeks of anticipation, the competition to win over Chandragupta Maurya’s sword is finally ready to come to an end. But with Ashoka and Sushim coming face-to-face with a tiger, we cannot help but wonder which historical character will finally claim what is rightfully theirs? Who will walk away a winner to the biggest prize in history? Colors’ show Chakravartin Ashoka Samrat (Contiloe) is gradually picking up its pace with its gripping storyline. And with Bindusara (Sameer Dharmadhikari) bonding with Ashoka (Siddharth Nigam), the show will take a new interesting turn. With this new development viewers will gradually witness Ashoka to become a strong and skilled warrior. But, we have to wait and watch how he will save himself from murder attempts on his life. We will keep our readers updated with more information. Who doesn't like to look back into the world gone by and learn a lesson or two about our warriors and kings? King Ashoka, the son of Chandragupta Maurya and one of the bravest, smartest and most popular rulers ever will come alive in our living room. He was not only a clever ruler, but also a compassionate leader who made sure his kingdom flourished. It would be fun to go back into history with this show. Don't you think? Siddharth Nigam, whose cartwheels were seen in Dhoom 3, will be playing the young Ashoka. He had to take extensive horseback and sword fight training for his role of the warrior. 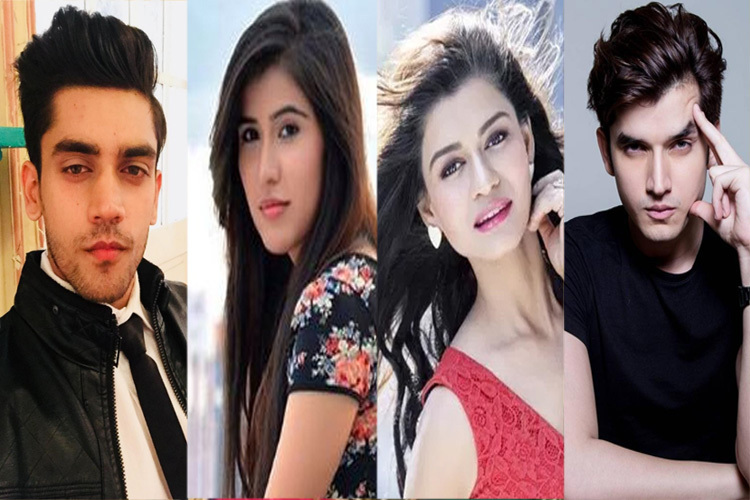 The youngster will be supported by the versatile Manoj Joshi as Chanakya, the talented Sameer Dharmadhikari as Bindusara, the beautiful Pallavi Subhash as Ashoka's mother Dharma and 'Haider' fame Sumit Kaul as Justin. If this cast doesn't excite you, we don't know what will! The lavish set, designed by Nitin Desai and Omung Kumar (Mary Kom director), will be one of the grandest to be displayed on the small screen. With most scenes having amazing VFX, it's also touted as one of the most special effects-prone shows to be telecast on TV. It wouldn't surprise us if it bags all the awards in this department, apart from all those for acting, direction and production scene! We can't wait for it, can you? Upcoming Colors’ show Chakravartin Samrat Ashoka (Contiloe Telefilms) has already grabbed the eyeballs with its teaser and trailers. After the recent launch of its promo, interest level has gone high. The enchanting tale of this Indian emperor has always fascinated us and we will love to see the narration of this warrior’s life story on screen. From the promos itself we think it will be an exciting watch. Here on Tellychakkar.com we present you with five reasons what we liked about the promo. After portraying the character of Rukmini in Mahabharat, Pallavi Subhash is back in an epic drama. The actress has essayed different types of characters in her acting career and the way she pulled them has proved that she is a born actress. Accompanying her is the wonder kid Siddharth Nigam, who has already mesmerized audiences with his power-packed performances in Dhoom 3 and in the Life OK show Mahakumbh. Naturally the acting chops of these two talented actors impressed us. With a National level gymnast like Siddharth present in the show, we can surely expect some high octane action sequences. From horse riding to sword fight to some stunning gymnastic stunts, the action scenes in the show will be an entertaining watch. When it comes to period drama, we love heavy ornament and ethnic wear. Be it the beautiful dress and simple yet elegant make up of Pallavi or Siddharth’s tattooed arms and his rugged looks, the costumes and make up are complementing the characters in every way possible. The tale of the great Indian Emperor has always fascinated us, so much so that even Shah Rukh Khan once portrayed the role of Ashoka in one his films. The story of an epic warrior, whose empire ranged from Hindu Kush to Bengal, preached Buddhism when he found peace and solace in the religion. We have to admit that the camera work wonderfully captures all the action sequences and crisp editing makes the show even better. These two aspects are definitely big highlights of the show. King Ashoka and his life-changing journey, that of going through a state of grief after the blood-filled Kalinga war, thus embracing Buddhism, has not been showcased on Indian television so far. Now, what we hear is that two popular GECs, Star Plus and Colors, recently got embroiled in a ‘war’ of sorts to present the story of Ashoka on screen, as per sources. For the uninitiated, news of Star Plus in association with Swastik Productions planning a huge show on King Ashoka was reported first in media. Star and Swastik who were on a high after the super-success of Mahabharat, wanted to make a project on the mighty warrior after doing quite a lot of research and planning. They were also in talks with actor Shaheer Sheikh (who was part of Mahabharat as Arjun) to play Emperor Ashoka. But, it was Colors who suddenly took the upper hand and announced their project of making a show on Ashoka. They came out with an announcement about Contiloe Telefilms making a historical for Colors on Chakravartin Ashoka Samrat. They also released a first look promo of their show, thus making things official in the content market. This decision of Colors apparently stunned Star Plus, the numero uno channel, and they were taken aback with the sudden development. And now, the big news coming in is that Star Plus, after going through a major brainstorming session, has decided to shelve their idea of making a show on King Ashoka. In defense to the announcement coming on Colors, an associated source told us that Contiloe Productions has been working on the show, to air on Colors related to King Ashoka for over a year now. Well, for viewers, they will enjoy and watch the tale of King Ashoka’s life on Colors. And as per our info, the Colors and Contiloe Productions’ show should hit screens post the culmination of Bigg Boss, that is end of December 2014. Colors spokesperson chose not to comment on the development. (Producer Contiloe Productions) but did not get any response till the time we filed the story. So all our wonderful readers, what do you think about this channel war to make a big-ticket show? Will Colors do a swell job, now that they are on course to making this project? You readers can certainly drop your comment here. Chakravartin Ashoka Samrat TV Show forum is a very active community of Indian television viewers worldwide discussing Colors's Chakravartin Ashoka Samrat TV Show. Our forum currently has over 950 active discussion topics about the show. And you will also find all the latest Chakravartin Ashoka Samrat videos, news, cast, synopsis, photo gallery, and much more only on India-Forums.com.